Methods for Increase / Decrease the Delay in Clock / Data path. Part5b -> Examples to calculate the “Maximum Clock Frequency” for different circuits. In the Last post we have discussed - how the wire length effects the slew? Now lets discuss about the effect of size of the transistors. Also before that let's discuss few basics also. There are 2 parameters – Width and Length, by which you can decide the size of the transistor. For a particular technology – Channel - length is almost constant. So it means Width is going to decide the size of the transistor. Below figure will refresh your memory - about which, parameter I am talking. How the capacitance are calculated (means whole derivation and explanation), I will discuss some other time, right now I am writing/copying the value of these capacitance directly. Note: the reference of above formulas is from the book written by “J.P.uyemura” - Cmos Logic Circuit Design Edition -2002. Now from the above, you can see that Gate Capacitance (this gate capacitance has 3 component – Gate to Base, Gate to Source and Gate to Drain) has dependence on the Width of the Channel (W). So it means, if you increase the width, Gate Capacitance will increase and Vice-Versa. Source and Drain Capacitance has a multiplying factor As and Ad (which is equavilant to WxLs or WxLd). It means source and drain capacitance also increases with Width of the Channel and Vice-Versa. Now let’s talk about the Resistance. 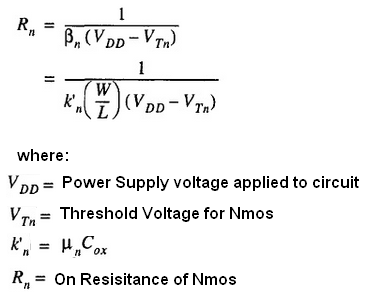 Below Resistance formula is with respect to NMOS. You can derive similar formula for PMOS also (Just replace subscript “n” with “p” J ). Now here the Resistance is inversely proportional to Width of the Transistor. I can’t write in a single line the effect of size of transistor on the slew because it’s not straight forward (I know you might have doubt on my statementL). There are some other factors which we have to consider. I hope, below paragraph helps you to understand the same. Capacitance Cgd12 is the Gate Capacitance of Driving Gate A due to overlap in M1 and M2. Cw is the wiring capacitance (pp, fringe, and interwire) that depends on the length and width of the connecting wire. It is a function of the fanout of the gate and the distance to those gates. Cg3 and Cg4 are the gate capacitance of the fanout gate (Driven gate). If we increase the size of the transistor (Width of the Transistor) it’s current carrying capability increase. Means “larger is the size of a transistor, the larger is the driving capability (the ability to source or sink current) of a transistor”. Thus a larger transistor would normally make its output transition faster (when output load is constant). The output load of a driving gate consists of the source/drain capacitance of the driving gate, the routing capacitance of wire, and the gate capacitance of the driven gate. The larger is the output load, the longer is the time to charge or discharge it. This would increase the transition (rise or fall) time and propagation delay. Let me summarize few important points. Means - Output Transition time of Gate A and Input Transition time for Gate B decreases. 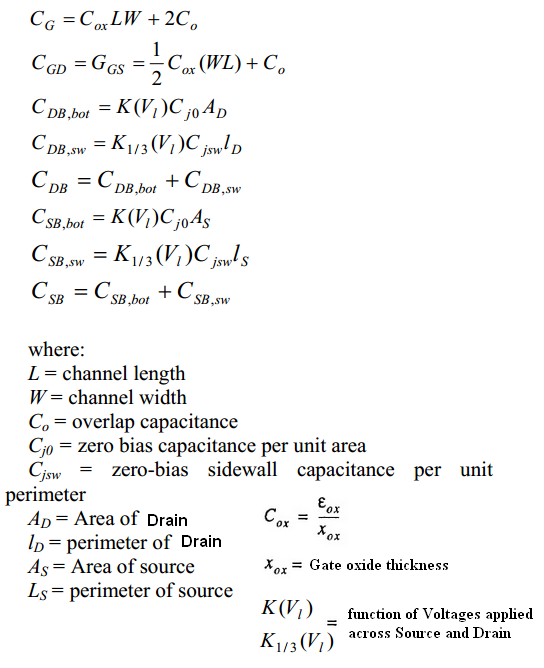 On increasing the Size of the Gate A – Source/Drain Capacitance also increases which are the part of output load of Gate A. Means it’s going to increase the output load. That means as I have mentioned in my point no 3 – that can be possible only when S/D Capacitance of Driving gate are not dominating the rest of the Capacitance. Which is only possible when either “Net capacitance is large” (length of wire is large) or “Size of the driven gate (Gate B) is large” (which increase the Gate capacitance of GateB) or “Both should be true”. But this increases pn junction area and hence CL. So if we want to use the size of the transistor as one of the parameter to increase/decrease of the propagation/transition delay, then we should have understanding of the design and also it depends on the property of Driven Cell and Net length also. "Delay reduces with increase in input transition and constant load capacitance". "Delay increases with increase in output capacitance and constant input transition"
Because on increasing the output capacitance – charging and discharging time will increase. 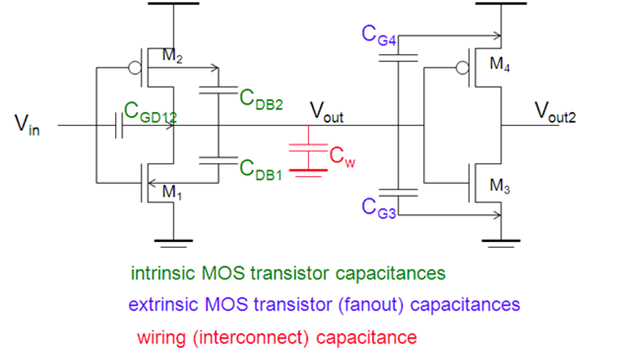 The delay of cell directly depends on input transition and output capacitance. In the next post we will discuss about the effect of Threshold voltage of the Transistor on the "Transition Delay" and "Propagation Delay". This proves that every time increasing the size of the Transistor will not work for fixing setup,slews,etc..
1.if we decrease W then source drain capacitance of driving cell,and gate capacitance of driven cell decreases but resistance get increase...so which factor we should consider,,,resistance or capacitance? No One can tell this 100%. but yes what ever be dominating - we have to consider their effect. I could not resist myself from commenting after reading this one. This is genius of an article, you are doing a great job. Just keep it coming. And thanks for posts so far. If we increase the size of the transistor, diffusion cap will increase. Will that not add to the output load cap and increase the time for charging and hence increase the delay (slew for the driven gate) ? Thank you so much for explaining about VLSI concepts.I like your way of explanation.I can easily understand your concepts.Keep in updating. You are clearly explaining the concepts..It's a innovative post..